As our culminating event of the 2017-18 season on Monday evening, April 23, Arizona Glass Alliance will very proudly host a presentation by the well-known glass artist and environmental activist Mary White. Long one of the leading artists working in glass and other materials, Mary continues to be passionate about the creative process, nature and earth care, and believes that combining art and environmental study is a healing process which guides us to mutual understanding, and helps us to find our own spirit. 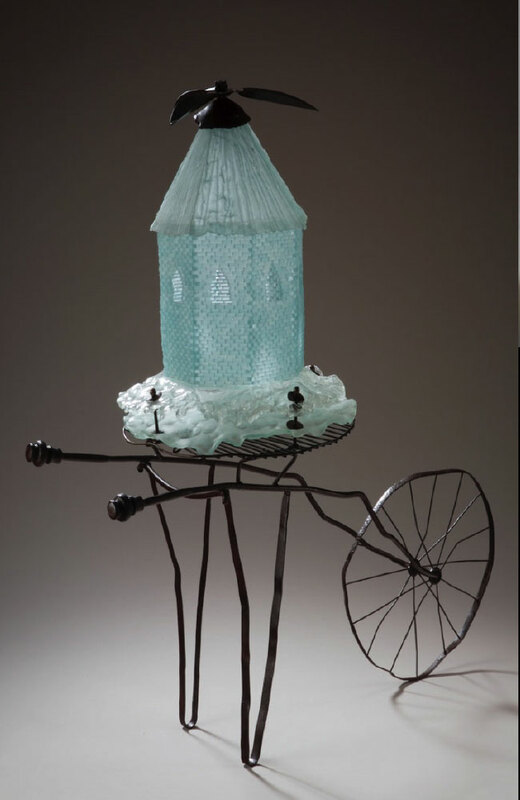 From 1985 through 2005 Mary headed the glass program at San Jose State University, and in 2009-10 she was a Fulbright Scholar at the National College of Art and Design in Dublin where she led a graduate seminar for students and members of the Crafts Council of Ireland. Mary has also taught at Corning, Pilchuck and the California College of Arts & Crafts, among many other places, and her work can be found in museums in Ireland, Spain and across the US, as well as such diverse collections as Marlo Thomas and the San Francisco 49ers. 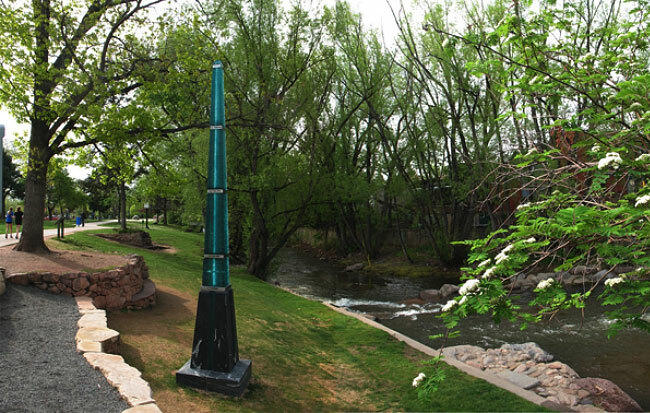 Mary’s interest in environmental issues led her to design and complete an 18 foot flood marker in Boulder, Colorado to bring visual awareness of the power of floods to viewers walking along Boulder Creek (an image of this marker is shown below). Also shown below is an image of one of Mary’s very well recognized “house” sculptures which can be found in the homes of many collectors. Mary is currently working on a triptych window commission for the Akataka Native American tribe in Grand Bayou, Louisiana as well as an illuminated sculpture for an exhibition in Murano, Italy, site of this year’s Glass Artists Society annual conference. Next: Photos from the Holiday Champagne Potluck Brunch celebrating Arizona Glass Alliance!